How greatly the manners of people differ is a trite remark. A Welsh courtship is a curiosity in its way. There is no nonsense in the shape of love-letters, - no flirting and playing at peep-bo round the corner - no fiddle-faddle about love and sheep's-eyes and will you marry me? but the matter is done off-hand, and the union is accomplished very much like that managed in Eden. 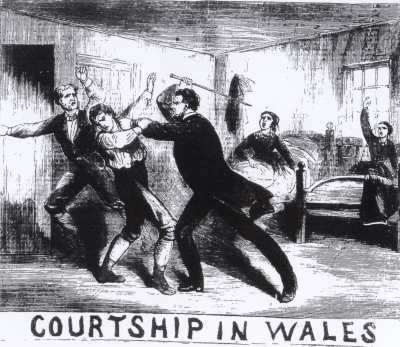 An illustrative case has just occurred at Aberystwith in Wales, where two farm servants sued a gentleman of independent means and a county magistrate for an assault committed upon them on the morning of May the 5th, in the year of grace 1870.
and evidently neither the proprietor of Gwynfryn nor his wife considered this custom of the country as of a kind that they could sanction, and raised an uproar that burglars, thbieves, and midnight marauders were in the house. The men were belaboured unmercifully, and they brought an action against the squire for damages. The justice inveighed strongly against the practice in Wales of admitting suitors to bed-rooms, a practice which resulted in immorality, seduction, illegitimacy, or a hasty marriage to cover shame. The practice tended strongly to immoraility, and was disgraceful, not merely to the servents who thus violated the trust reposed in them by their employers, but to those who acted in concert with them. By the medical evidence the plaintiffs were clearly the subjects of serious injuries; had it been otherwise, his inclination would be to give them one farthing as damages, as they were trespassing, and for an immoral purpose. This was all very well; but the jury before whom the case was heard gave £15 in damages in each case, being £30 in all, with full costs, thus showing their sympathy with the customs of the country. Now, we are not about to justify or extenuate those customs, but if any of our readers will turn to the affecting tale of Ruth, which occupies a small niche in the Old Testament, they will find that a somewhat similar practice, though infinitely more modest, obtained in those patriarchal days. But the fact is that this custom is neither confined to Wales nor to the ancient habits of primitive society. It exists in Scotland at the present time. In Orkney the very same practice prevails, and is, no doubt, the cause of much rural immorality and shame. We are rather old-fashioned in our notions; and prefer that the women keep the men at arms' length until the question is popped and answered, and all matrimonial arrangements made. Everything that trenches on female modesty is to be frowned down; and no woman, however humble, shows proper self-respect who allows a man to approach her unbecomingly and irreverently.